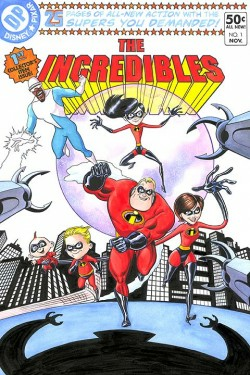 Bill Morrison Signed and Numbered Giclée on Canvas: "The Incredibles #1"
About The Artist: Though he's most famous for his comic book work featuring The Simpsons, Bill Morrison began his career as an illustrator working mostly in the field of motion picture advertising. He's painted dozens of memorable movie posters, many for Walt Disney Pictures animated films, including Bambi, Cinderella, Peter Pan, The Jungle Book, The Prince and the Pauper, Rollercoaster Rabbit, The Little Mermaid, and many more. When The Simpsons creator Matt Groening founded Bongo Comics, he hired Morrison as art director. Bill drew the very first Simpsons comic story and has had a hand in every Bongo comic book to date, either writing, penciling, inking or supervising. Morrison also worked with Groening on early character designs for the TV show Futurama and served as the series art director. In his spare time, Bill has written and drawn his own comic book series, the four-time Eisner Award™-nominated Roswell, Little Green Man, and co-created two comic book series; Heroes Anonymous, and Lady Robotika, the latter with Jane Wiedlin of the legendary all-female rock band, The Go-Go's. Bill is extremely excited to have contributed to The Pixar Collection, paying homage to the most comic book inspired film of them all, "The Incredibles". With a creative nod to the historic cover of "Teen Titans #1", Bill infuses all the action and promise of adventure that classic comic book covers are so beloved for.